Model T Ford Forum: Hub powder coater question. Model T Ford Forum: Forum 2018: Hub powder coater question. My powder coater is saying that it is difficult to powder coat wheel hubs because there isn't much room for the tape to cover the bearing races to keep the powder coat out. Any advice? Paint the wheel after assembled. As it is, I think the powder coating might be too thick to assemble the flange plate on to the hub. The flange should be a tight slip fit onto the hub. The area where the spokes go would only need the thickness of paint if anything. Something to think about, when the bolts are pulled tight it can cause cracking and chipping in the coating around the the area where the flange rides on the hub, bolt heads and nuts, this will allow moisture to enter. Rust can form under the coating. I am not a fan of powder coating, it has it's place. Even when wheels are powder coated is is suggest to remove the coating where the lug nut fits. Gives the lug nuts a solid surface to sit on and keeps the coating from ugly chips around the holes. I disagree on removing material from the inside diameter of the hole in the flange. It should be a slip fit, metal to metal contact, between it and the hub. There is a reason for a slip fit, the flange would be tight to the hub and help prevent too much movement. Adding a layer of coating and opening it up would allow movement as the wheel flexes. Think of the rim and spokes as a lever, when side force is apply there has to be movement someplace and that would be at the hub. I would do just as Ford did, assemble the wheel then paint. I do not think using the coating to support the flange on the hub is a good idea. Then we can agree to disagree. I only remove enough metal to still make a snug fit. 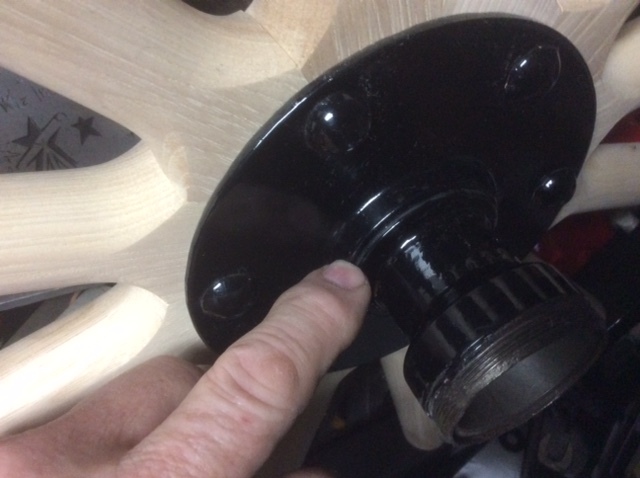 It does scratch the hub lightly when assembling but easily touched up. The original post was how to protect the bearing races, and my solution works best for me. Mark, I am in your camp on this. An etch primer on all before assembly, and black enamel on all that can be seen before assembly, then touch-up if needed once assembled. I believe there should be no paint build-up anywhere the wooden spokes come in contact with the hub components.